How was our universe created? How our planets came into existence? When we look around at our surroundings in childhood, many of us wonder how everything around us came into being, and this even continues throughout our adulthood. Everything we see today – stars, planets, meteors, were actually not there at the beginning. So, where did they come from? The answer lies in The Big Bang Theory. The big bang theory is an attempt to understand how the universe formed from a hot and dense point into what it is today. 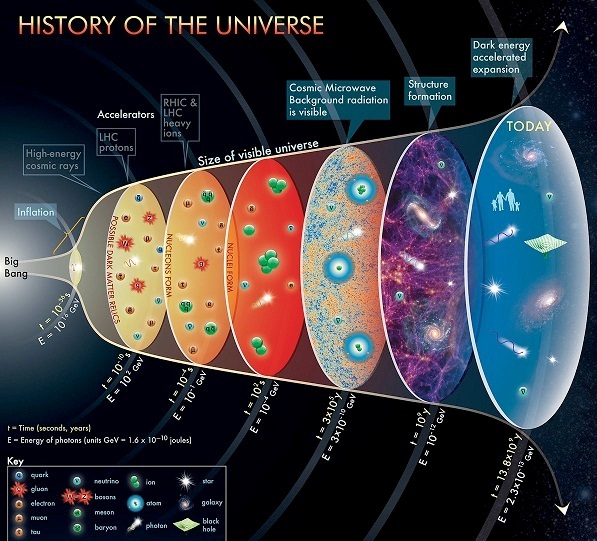 How the idea of the Big Bang arrived? The idea of the universe was suddenly born by chance. Up to the middle of the 20th century, most of the astronomers believed that the universe was ageless and infinite. After Einstein gave the theory of relativity in 1915, the physicists started thinking of the universe as dynamic and revolving. In 1927, the astronomer, Georges Lemaître, said that our universe had begun from a single point and then expanded to what we see today, and according to him, it will keep on expanding with time. After two years from this, Edwin Hubble, found that galaxies are moving away from us! He also found that it appears to occur at speeds proportional to their distance and that it’s occurring in all directions (Figure above). In other words, he observed that the universe was experiencing an ongoing process of expansion. This observation has come to be known as Hubble’s Law. In 1965, Arno Penzias and Robert Wilson, discovered cosmic microwave background radiation, and with this discovery, Big Bang Theory gained widespread support. Using radio telescopes, the two astronomers detected cosmic noise, that didn’t dissipate over time. Collaborating with Princeton researcher, Robert Dicke, the pair confirmed Dicke’s hypothesis that the original Big Bang left behind low-level radiations; detectable throughout the universe. It is difficult to imagine the time billions of years ago when the entire universe existed as a singularity. According to Stephen Hawking, since the events before the Big Bang has no observational consequences, the concept of time began with the Big Bang. No one knows what happened before the Big Bang. When the universe began, it was just very hot, tiny particles mixed with energy and lights. One second after the Big Bang, the temperature had fallen to about a trillion degrees Fahrenheit, and protons and neutrons appeared on the scene. Then came several minutes of nucleosynthesis (nuclear fusion), when these subatomic particles fused to form the nuclei of the first atoms- mostly hydrogen and helium. By the 375,000 years after the Big Bang, the temperature had fallen to 5,400 degrees Fahrenheit, and the universe became transparent, freeing visible light and other forms of electromagnetic radiation to travel across the cosmos. Much later, some 300 to 500 million years after the Big Bang, clumps of matter were held by the gravity. Every matter grouped to form atoms, atoms to molecules, and finally, molecules grouped together to form trillions of stars and billions of galaxies. Galaxies are at a great distance away from each other and back at the time. How long did it all take place? The universe began almost 13.8 billion years ago with the massive expansion event; as the name of the theory says- the Big Bang. Nearly, all astrologers and cosmologists now accept The Big Bang Theory after having the greatest evidence of cosmic wave background radiation theory.